This booklet follows the same daily prayer topics as the edition for adult readers, but it also includes illustrations and some fun activities. The reduced, simpler text is geared toward elementary school-age children. So, consider involving the younger members of your family or church. 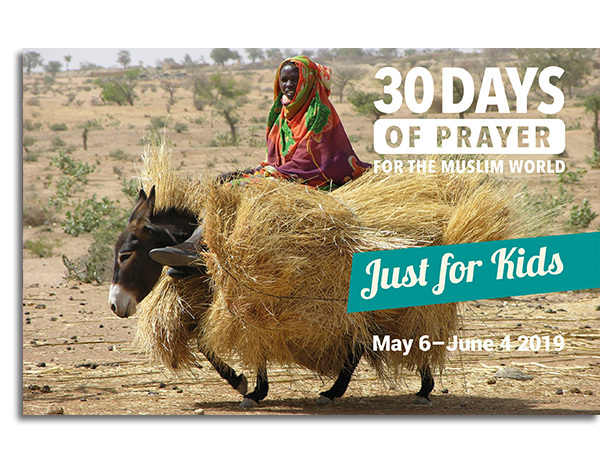 This annual worldwide 30 Days of Prayer for the Muslim World is for Christians to humbly learn about Islam and pray for Muslims during Ramadan, Islam’s important annual month of fasting and religious observance. My whole perception of the Muslim people has changed. I used to have a vague perception of them as being extreme and scary—and far away, not my concern. After praying for them for 30 days I find myself much better educated about their beliefs and culture, AND, I have a heavy, compassionate burden to see them come to the truth in Christ, especially the women and children. In North America, the 30 Days of Prayer for the Muslim World has been owned and coordinated by WorldChristian.com since its inception in 1993.